I picked up this book when I was in New York City, and I started reading it when I'll stand at Matt's house in Brooklyn, and it just happens that the author Amanda Petrusich, starts out the book in Brooklyn which I thought was kind of awesome. 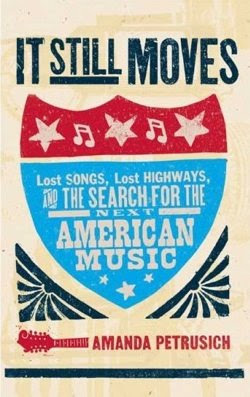 The book is mostly a overview of the different types of American music, and how they came about. It starts out with an explanation of Goodbye Babylon a 4 cd Box set from Dust to Digital, something I have been eying for awhile. Then she jumps in her car and travels the US well parts of it, and finds her self at Elvis' Birtplace, the sun records studio, Nashville, a shack in the Mississippi Delta, the past store of one A.P. Carter, and a bunch of other really cool places like the headquarters for Folkway Records and the Woodie Guthrie Publication building. Mixed in you get bits of information about all of the music to spring from these and other places. The book is really well written and great fact finding non-fiction. I really enjoyed reading, partly because a lot of the things that she did in the book, that being the road journey through the United States searching out music, and the fact that it's about music that I like helps. At the end of the book she investigates new weird America, a genre of music that is doing its best to not be a genre that the same time is a genre so speak. Some of the artist's that are involved with this are Devendra Banhart, Joanna Newsom, CocoRosie as well as others, I am rather familiar with this genre an all though she does an ok job describing it, the cameos I think fall short for example she interview the Fruit Bats which I have never considered a part of this genre is featured while other acts such as the ones mentioned above have none. All things considered it's worth picking up if you like or think you will like such a thing. I love the idea of this book! May I borrow it back in Brooklyn when you are finished? Ill add it to my summer reading list. Yea, it's in Rochester, MN I could have my parents send it to you if you wish. This does sound like a great find! I'm going to listen to the snipet remix this afternoon.